I have received this can of Clean+Green by SeaYu. SeaYu was founded by Quincy Yu and her adorable dog Simon. Quincy's goal is to provide a clean safe home. Being a mother and having a busy house full of kids and pets is what drove her to create her cleaning products. These products are safe for the whole family and help to preserve the earth. Not to mention, they are super easy to use! Quincy has formulated a line of products that you can use on all surfaces of your home. Each one of them passes Simon's "sniff" test. 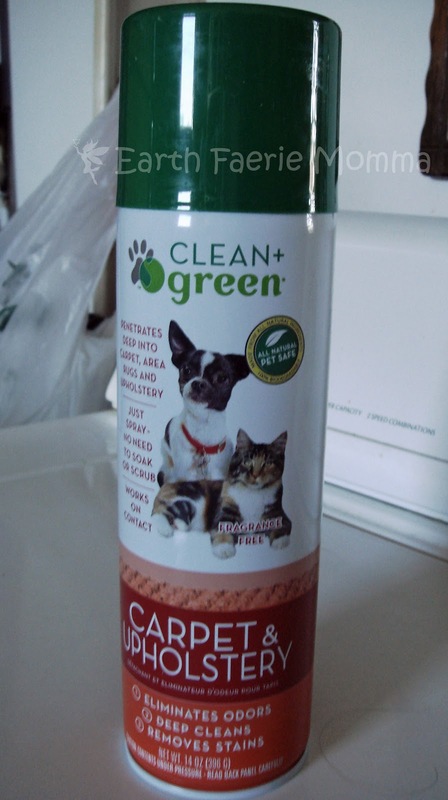 I chose to try the carpet and upholstery cleaner. I have a problem cat that does not always go in the litter box. I have tried numerous products for the urine smell. When I first tried Clean+Green, I was very impressed. 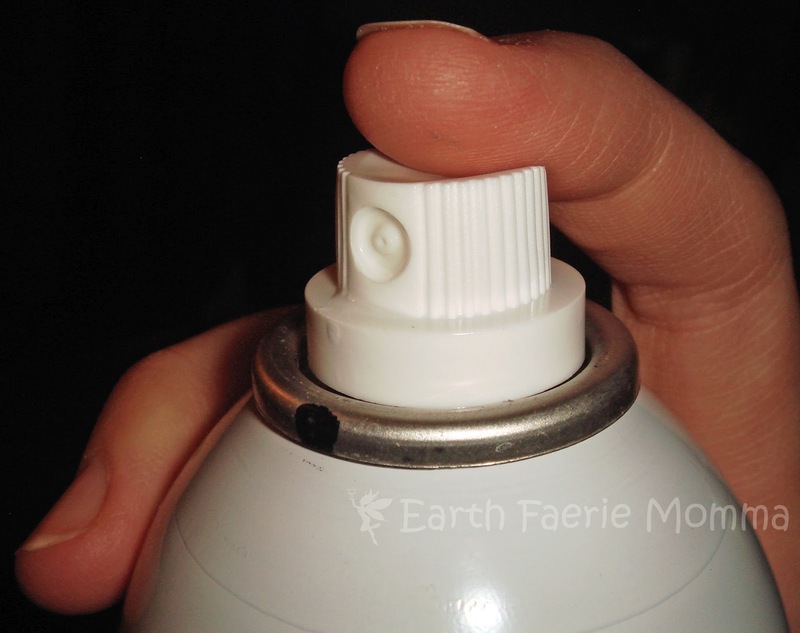 I made sure the area was dry and I sprayed it on. That was it! No soaking, extracting, rinsing or scrubbing. The stream came out fast and strong. I bent down and gave the carpet a sniff. The smell was gone instantly. The odor was not masked by nasty fragrances either. It left a sort of sweet refreshing smell. So, I left the spot to dry and came back the next day. There was still a faint odor because I am sure the cat urine was pretty deep into the carpet. I gave it another round and that took care of the odor in that area, so I moved on to another spot. Here is where I put it to the real test. Our cat has his favorite "go to" area (more like "go pee" area). Thankfully, I am able to lift up the carpet. I found that he has peed there more than once and it is going through to the carpet padding. I started by soaking up what I could with a towel and making sure it was dry. Then I carefully sprayed each layer. Right away Clean+Green helped to take away some of the discoloration in the padding. After one more application it has helped take away most of the smell. It has done better than any other product I have tried. We have a wood floor under the carpet. I have been pouring other cleaners onto the stains repeatedly, which is keeping the carpet and padding in a continuous wet state. That is not good news for the wood underneath. With Clean+Green, I don’t have that problem. I think with the propellant spray design it is more concentrated and needs less water. Therefore, it cuts down on cleaning and drying time. The product I chose, which is the carpet and upholstery cleaner, can be used on any water safe surface. 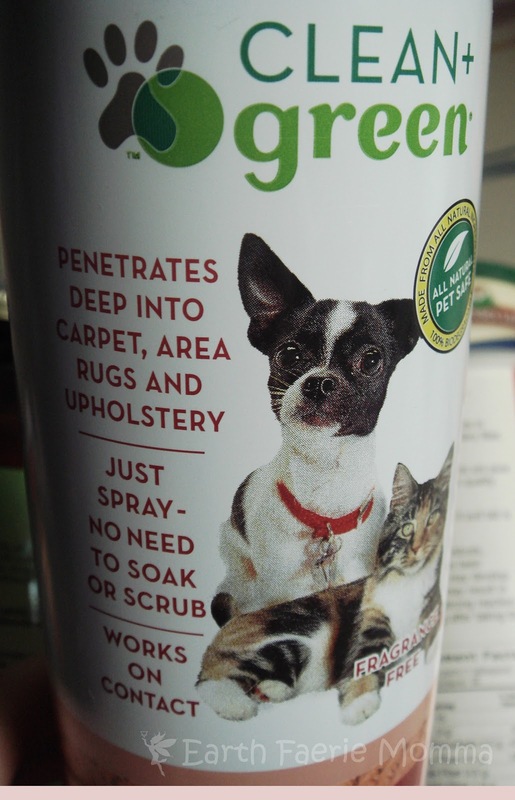 That means it can be used on beds, couches, chairs and carpets. I love that it is natural and safe. It is biodegradable, water soluble and fragrance free! The ingredients are: Cane sugar derivatives, proprietary blend of botanical extracts, hydrated cellulose (cleaning agents) purified water and nitrogen. I love how easy it is to use! With a toddler running around it is hard to find time to clean up such a stinky mess. With Clean+Green I was able to pull up the carpet, spray, and be done in less than 15 minutes. I would like to see larger sizes available in the future. It says the can is recyclable but I don't know how I would do that where I live. Most consumers tend to throw bottles and cans away if they don't know how to recycle them. So, larger cans would mean less waste and more wonderful product! It is nice to find someone who is dedicated enough to create and share great products (ones that are safe and efficient). I highly recommend Clean+Green and plan to use it again in the future. I would like to try the Auto Cleaner and the Litter Box Order Eliminator. At http://www.odorandstainremover.com you can get free shipping. A 14 oz. can runs about $10-$13. Come back April 12th-22nd for the Earth Day event for a chance to win 3 cans of Clean+Green!